It was said they, “lived in squares, painted in circles and loved in triangles”. 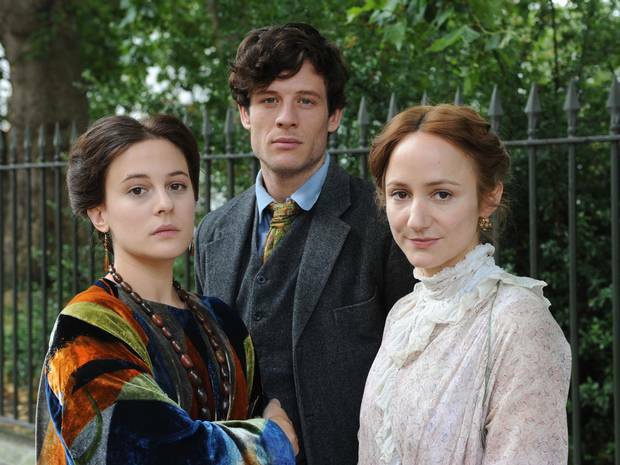 The Bloomsbury Group’s complicated work, loves and legacy come to BBC2 in a new three-part drama Life in Squares, starting tonight at 9pm. Wilmington Square in Islington plays the title role, as Bloomsbury’s Gordon Square, where Virginia Woolf and her siblings, including Vanessa Bell, lived. As did the economist John Maynard Keynes, writer and biographer Lytton Strachey, art critic Clive Bell and artist Duncan Grant. Take a look at the trailer here. The location shots were filmed between late July and early August last year, with all the main characters, along with horse-drawn carriages and period cars. Residents were extensively consulted first and donations were made to both the residents’ society and the square’s wildlife group Feathered Friends. The funds to the residents’ society will be put towards repairing the Georgian railings of Wilmington Square Garden. Ms Quint adds that the filmmakers were flexible as well as courteous regarding their use of the square, meaning residents weren’t inconvenienced by signs being covered, and were able to load and unload their cars, despite the road being briefly closed to traffic for filming. Wilmington Square Society Chairman Rashid Hussain says, “The day of filming was fun, and was not at all disruptive. It was nice to see a small part of the square recreate what it would have possibly been like in that period. And Ted Hoskins praised the filmmakers for their trouble free impact on residents. Also in the series, Conway Hall in Camden’s Red Lion Square hosts a dance, filmed there in August last year. It covers 40 years, from the death of Queen Victoria to the Second World War. In 1901, the then young friends attempted to escape the social shackles of Victorian England and embrace lives dedicated to creative and sexual freedom. FilmFixer manages the film office for both Camden and Islington councils. FilmFixer director Karen Everett was delighted by Wilmington Square’s lead role in the drama, and the support of its residents, saying, “We like to specialise in making London available for period dramas, but a great deal of co-ordination is needed. We have to negotiate traffic management and street dressing, removing modern cars and signage.